At an Ellsworth Distribution Center, item attributes and lot control are the key to our accuracy, traceability, and efficiency. To maintain superior lot control, Ellsworth utilizes a highly enhanced WMS (Warehouse Management System). 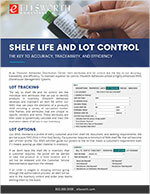 The key to shelf life and lot control are the individual item attributes that we use to identify products in inventory. Ellsworth develops and maintains an item file within our WMS that can track the elements of a product's shelf including a variety of calculation modes, time frames, and attributes that are unique to specific vendors and items. 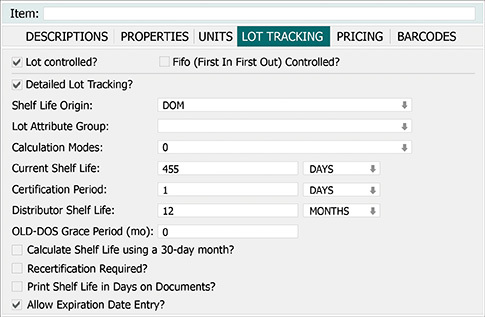 These attributes are then used to systemically calculate and track the expiration dates of all lots in our inventory. Our WMS maintains a profile of every customer and their shelf life, document, and labeling requirements. We are not a pure FIFO (First In First Out) facility. If a customer requires a minimum of 50% shelf life, that will become part of their profile. Our WMS will then guide our pickers to the lot that meets a customer’s requirement even if it means passing up older material in inventory. If we don’t have the shelf life in inventory that a customer requires, the picker will be alerted to take the product to a hold location and it will not be released until the Customer Service Representative approves the release. If an order is staged to shipping without going through the authorization process, an alert will be sent to the inventory control and order prep teams alerting them to the event. In the Inventory tab within our WMS, shelf life detail is systemically calculated and kept. This data is used to allocate the proper shelf life to a customer's profiled need. Our WMS also records every Receipt, Pick, and Ship activity at the lot level with a time stamp. Our WMS maintains lot audit trail for all Item/Lot combinations which allows for quick reporting of all orders that received a specific lot.